Three days after my Man of Steel screening, I still can’t resolve whether Zack Snyder’s movie doesn’t work, or he didn’t deliver the movie I expected. There’s a difference, though both are separated by a fine line. Steel struck me as false from its opening moments, and never regained its footing. The difficulty, so far, lies in putting my finger on any one reason why the movie let me down. The pace, the tone, the narrative decisions, the action choreography … I disagree with 95% of it. Snyder’s morose, indecisive Superman may not be my version of the hero, but I kept waiting for him to at least convince me his vision for the classic character had merit. He didn’t. 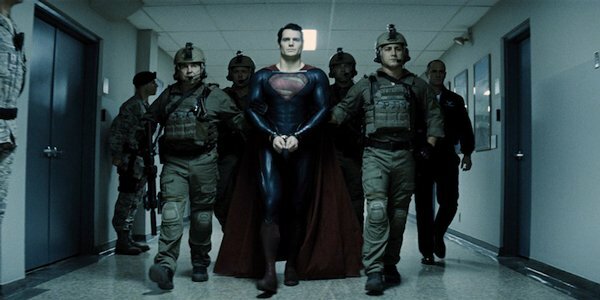 Summarizing Man of Steel, I’m reduced to this one honest assessment that, I believe, dooms Snyder’s movie and – possibly – the future of the D.C. cinematic universe: I didn’t enjoy this contemporary Superman movie. And that makes Man of Steel a very hard film to recommend. Plot details will be kept to a minimum in this review, but there are SPOILERS AHEAD. I’d advise you to experience Steel, then come back and read where I think the movie went wrong. What frustrates me the most is that I think Snyder and screenwriter David S. Goyer made a Superman movie that speaks to the contemporary comic-movie audience. But as the film unfolded, it rarely felt like a Superman movie I ever cared to see. The chapters in Superman’s mythology are present, but distorted – tweaked to fit a science-fiction atmosphere that influences all of Man of Steel … starting with a Star Wars-esque prologue on Krypton that introduces key figures Jor-El (Russell Crowe) and General Zod (Michael Shannon). You would need a two-hour standalone movie to properly digest all that is presented on Krypton, from Kal-El being the first “natural” birth in decades to the corruption of the once-mighty planet by flawed leaders who’d rather drill than “look to the stars.” Political and religious allegories mash together, then are discarded for a Jor-El Zod fistfight because, simply, Snyder is including combat at every possible turn to counter Bryan Singer’s pacifist take. We don’t have two hours, however. We have 15 minutes. Time is a significant problem for Man of Steel. Though the movie runs a hefty 143 minutes, it always feels like it’s in a rush to get to the next pre-determined “important” scene, short-changing each manufactured beat in Superman’s rich story. Sensing that he doesn’t have enough time to elaborate on the emotional ties that bind these characters, Snyder tells us what he thinks we need to know in the first of many long-winded, dry character monologues. These speech passages will destroy any poignant connections attempted to be forged by Crowe, Shannon, Henry Cavill, Amy Adams and, most criminally, Kevin Costner. Man of Steel changes directions so often, it’s tough to follow and harder to stay invested. Here’s one lengthy example of bad plotting that leads to head-scratching misdirection: Clark Kent (Cavill) is established as a drifter who’s wrestling with internal conflicts but often aids those in need of rescue. While working on a fishing boat, he leaps to a burning oil rig and holds up a massive chunk of crumbling girders long enough for men to escape to safety. Clark ultimately lands in the water, triggering a flashback to his Kansas upbringing. (Goyer used flashbacks in Christopher Nolan’s Batman Begins, but they cut the narrative flow here in ways that create a herky-jerky, stutter-stepping pace.) By the time we catch back up to present day, Lois Lane (Amy Adams) is arriving at the frozen sight of a downed spacecraft, and Kent is taking her suitcases off of a helicopter. Wait, what? Kent works for this ice-exploration company now? I mean, yes, Snyder has suggested that he is a man who accepts random jobs a la Bill Bixby in the Hulk television series, but when did he get this job? How did he embed himself in a military chain of command so that he’s able to walk onto the mysterious alien object that’s frozen in ice and retrieve crystals that will turn into his Fortress of Solitude? That sensation cropped up often as Man of Steel created resounding questions that worked against the story it said it wanted to tell. The contradictions literally kill Pa Kent in the movie’s clunkiest scene. This noble, pious farmer reminds his adopted son, Clark, at every chance he got that it was up to him to decide what kind of man he wanted to be. Yet, when Clark tries to decide to “reveal” himself and save his father figure in the process, Jonathan Kent waves him off – in the middle of a tornado sequence that’s laughably corny and, at the same time, unfortunately insensitive thanks to recent events in Oklahoma that are obviously outside of Snyder’s control. Other confusing issues with the film certainly ARE in Snyder’s control, and he drops the ball. What was that tentacled beast Superman was fighting in the Indian Ocean? How come he’s able to simply decide to defeat it at a moment’s notice? Why did Jor-El embed the Codex – the summer’s lamest MacGuffin – in Kal-El in the first place? What was his end game, and how would that act have benefitt=ed the dying planet of Krypton? Didn’t anyone tell Snyder that his “babies-in-pods” is a direct steal from The Matrix? Shouldn’t Lois Lane be completely freaked out by the fact that she just boarded a spaceship (!! ), is wearing a mask that helps her breathe in the deepest reaches of space, and can now pop off laser blasts like she’s Han Solo, shooting first because a Jor-El hologram tells her where her video-game opponents are standing? Admittedly, I like Snyder and Goyer’s decision to adopt a sci-fi angle to Superman, treating Kal-El as an alien who’s initially distrusted by our military and our society is an intelligent and unused twist that could have given Man of Steel a fresh perspective. Except, Snyder and Goyer can’t stay away from the Christ imagery that bogs Superman’s story down in heavy-handed symbolism … as when Clark makes a disjointed pit stop to a Catholic church to get advice from a parish priest. Because, okay? “But at least Superman hits people, right?” Yes, there are fight sequences in Man of Steel, and occasionally, they are exhilarating – particularly the POV camera shots where Kal-El is beating Zod from one end of Metropolis to the next. If you’ve seen Snyder’s films, you know he appreciates up-close camera shots that place you in the action, which gets disorienting once Kal-El and Zod decimate large swaths of Metropolis in their climactic confrontation. He also knows exactly where the 7-11 logo is, or where the IHop sign should be framed so as not to interfere with the action on screen. Seriously, Man of Steel suffers some of the most blatant product placement I've seen in recent memory, especially during the Battle of Smallville, which appears to have been sponsored by Sears. Unfortunately, Snyder’s decisions to portray Superman as a hesitant savior keep the hero at an arm’s length from us, the audience. He isn’t sure if he’s ready to save us, so we’re not really sure we’re ready to embrace him. I cared little for Superman as the movie raced to its “breathless” conclusion, so the wanton carnage and the digital-heavy window dressing of Man of Steel’s final act resembled the latest techno-playgrounds of the bombastic Michael Bay. As skyscrapers tumble and Zod tries to fry innocent citizens – before Superman murders his enemy before the very people he’s sworn to protect – Man of Steel becomes the angry, jaded Revenge of the Fallen in a recognizable red cape. Summer blockbusters are supposed to be fun. Even Nolan’s Batman movies, which are being heralded (or blamed) for this rash of darker, edgier superhero movies, had a sense of comic-book escapism to them. Batman Begins is a roller-coaster ride with a valuable sense of humor. And The Avengers, in comparison, looks like Airplane! next to the deathly serious Man of Steel. Never once did I have fun during Snyder’s movie. Is that my fault, or his? I’ll have years to think about it. Reports say the director will be back for Man of Steel, and that Justice League is his project to lose. That should give D.C. fans some sense of stability in their often-rocky film community. All I feel is disappointment.